Monitoring all aspects of your practice's performance is key to driving improvements. Typically, this is achieved through monthly, quarterly and yearly reports. Ultralink revolutionises performance monitoring by tracking indicators continuously to generate live reports, as well as the more traditional kind. Ultralink generates reports in real time, allowing you to constantly monitor your practice, respond rapidly to unforeseen challenges and proactively manage service levels. 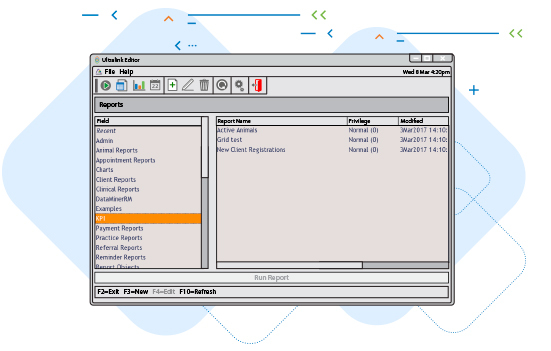 Reports can be set up to feed live data into custom-built dashboards, where the results are displayed collectively in various formats. Tables, charts, indicators, gauges and the many other options available mean that key data can be viewed at a glance. 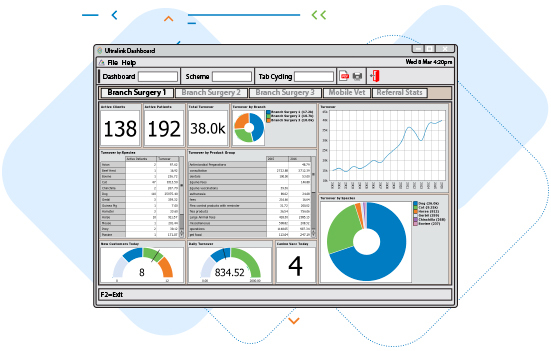 Dashboards can be created in any size and made available throughout your practice. They can be permanently visible on any screen or embedded within your Spectrum software to provide context-aware information on demand. You can set up separate dashboards for use by different members of your staffing team or to suit your practice requirements. For example, financial reports, appointment or sales analytics and client or patient demographics. Privilege levels can be set for both reports and whole dashboards, ensuring practice data is available only to staff in positions requiring the information. Every dashboard and the individual reports contained within it can have a specific update schedule assigned, allowing you to customise how you view your practice information. Reports can be set to update when best suited for your practice, with manual updates at the click of a button. Data from Ultralink reports can be exported and saved for easy integration with Microsoft Excel or other programs. 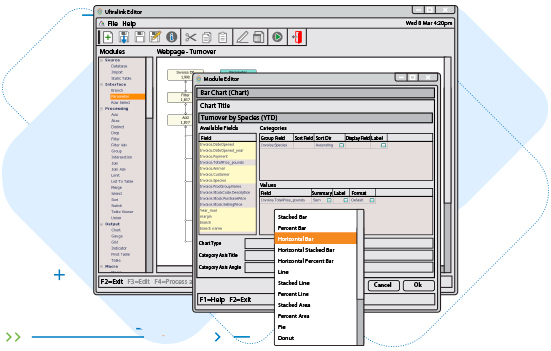 Organise large or multi-section dashboards into tabs that rotate periodically, like a rolling slide show. These tabs make it easy for you to sort your live reports into categories, for example, to show statistics for individual branch surgeries or different reporting types. Ultralink can be used to generate useful information for any of your practice processes and activities, enabling you to make immediate changes to improve performance. Integration with Spectrum software enables reporting on areas such as, sales, stock, appointments, microchipping, pet health parameters, reminders and insurance claims; meaning that Ultralink can provide an exponential number of possible reports. Ultralink comes pre-loaded with a range of common reports covering every aspect of your practice. These can be amended and customised, or new reports can be created using the in-built report editor. 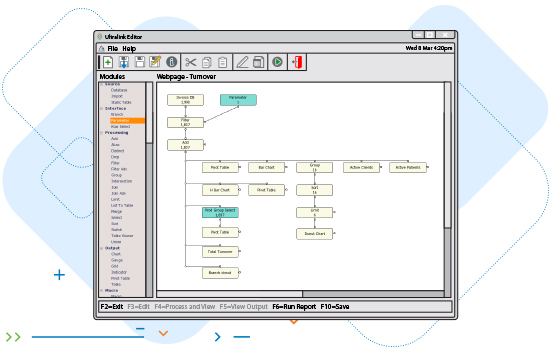 With over 35 different methods of inputting, interacting with, processing and outputting data, the report editor allows for an unlimited number of unique reports to be created using an intuitive drag-and-drop interface.